A free rider is a person who benefits from something without expending effort or paying for it. In other words, free riders are those who utilize goods without contributing their fair share. The free rider problem is an economic concept of a marketMarket EconomyMarket economy definition - a pure market economy is an economic system where there are no regulations and players are free to trade as they please failure that occurs when people are benefiting from resources, goodsGross National ProductGross National Product (GNP) is a measure of the value of all goods and services produced by a country’s residents and businesses. It estimates the, or services that they do not pay for. If there are too many free riders, the resources, goods, or services may be underprovided. Therefore, this would create a free rider problem. The problem is commonly seen with public goods (goods with non-excludable benefits). John builds a lighthouse on the coast to serve as a navigational aid. As a result, all sailors are now able to benefit from the lighthouse even if they are not paying towards its upkeep. If too many sailors are free riding, there would be no incentive for John to build more lighthouses as he is the only person contributing to its upkeep. Wikipedia, a free encyclopedia, faces a free rider problem. Hundreds of millions of people use Wikipedia every month but only a tiny fraction of users pay to use it. A large majority of Wikipedia users do not pay to use the site but are able to benefit from the information provided by the website. Non-rival: ConsumptionPigou EffectThe Pigou Effect is a theory by famous anti-Keynesian economist, Arthur Pigou. It explains a relationship between consumption, employment, output & wealth of the good or service by one individual does not reduce the availability of the good to others. Non-excludable: It is impossible to prevent other consumers from consuming the good or service. Public goods create a free rider problem because consumers are able to utilize public goods without paying for them. The free rider problem can be illustrated through a prisoner’s dilemma game. Imagine there are two people, Tom and Adel, who are considering a contribution to a public good. The personal cost of contributing is $6 and the benefit of the contribution is $10. This is a good idea for society as a whole, as the benefit is greater than the cost (each person contributing $6 would receive a benefit of $10). However, individuals see an incentive to free ride as the benefit of this public good is divided equally among the members of society. If Tom and Adel both contribute, the total benefit would be $20. 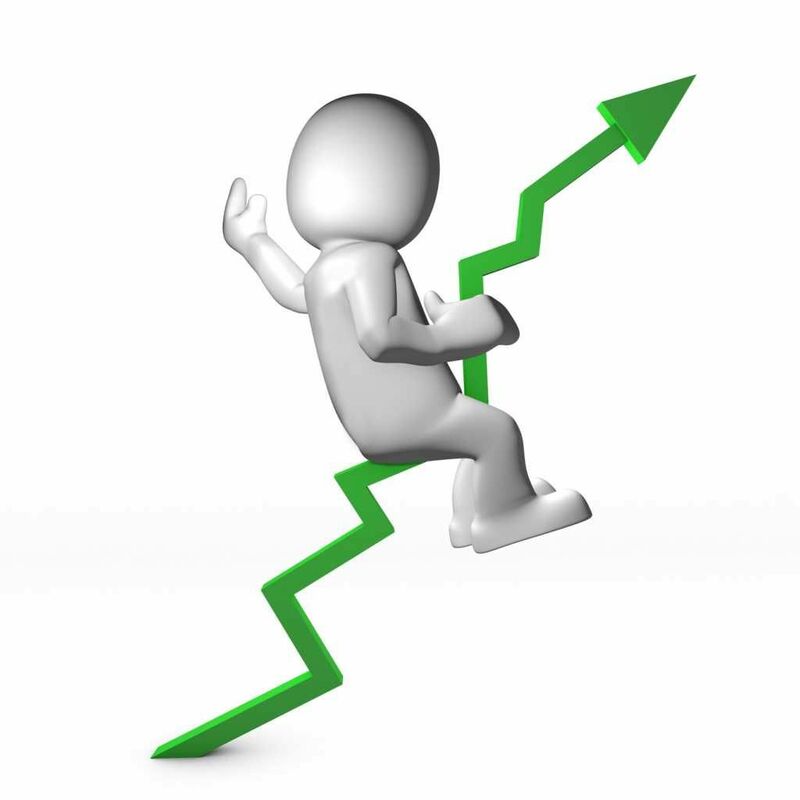 Each person gains $10 for a net gain of +$4 ($10 – $6). If one person contributes but the other does not, the total benefit would only be $10. Each person gains $5 and the person who contributes would realize a net gain of -$1 while the person who does not contribute would realize a net gain of +$5. 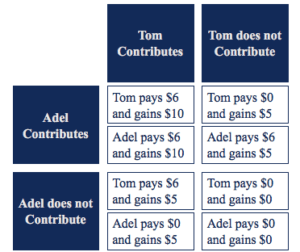 For example, if Adel contributes and Tom does not contribute, Abel would be contributing $6 for a net gain of -$1 and Tom would be contributing $0 for a net gain of +$5. (This is because the benefit of the public good is divided among all members of society). If neither Adel or Tom contributes to the public good, there would be no costs and no benefits of the public good (net gain of $0). In the prisoner’s dilemma game above, we can see that both Tom and Adel would attempt to free ride (not contribute). The rationale is as follows: if Adel thinks that Tom will not contribute, she would lose $1 for contributing. On the other hand, if Adel thinks that Tom will contribute, she would gain more by not contributing. Therefore, both people would come to the conclusion that it would be unwise to contribute. The public good, therefore, does not get built and thus a free rider problem is created. By requiring all consumers to pay taxes, there would be no free riders. For example, the cost of national defense in the United Kingdom is over $30 billion. By requiring everyone to pay taxes, the cost of national defense can be sustained. As taxes are paid by everyone, there would be no free riders. Also, the benefit would be enjoyed by everyone. (Think about the example above: If Tom and Adel were required to contribute to the public good, the public good would be built and they would both enjoy a net gain of $4). If a public good can be limited (requiring a payment to consume the good), there would be no free riders. Soliciting donations is only effective for low-cost public goods. The voluntary donations by consumers could make up for the free riders. For example: asking for donations in a garden or museum. Although there would still be free riders, the donation amounts would help cover the cost of the garden/museum.